As you may already know this year for Halloween my husband is going to be the Mad Hatter, I am going to be the Queen of Hearts, and my daughter is going to be Alice from Alice in Wonderland. Recently, I did a tutorial for a DIY No Sew Tutu. I wanted to show you that with this tutorial, you can apply it to virtually any Disney Princess character (or any character for that matter) and make your own DIY Disney Princess Costumes. Here is my skirt for my Queen of Hearts costume using the tutorial. 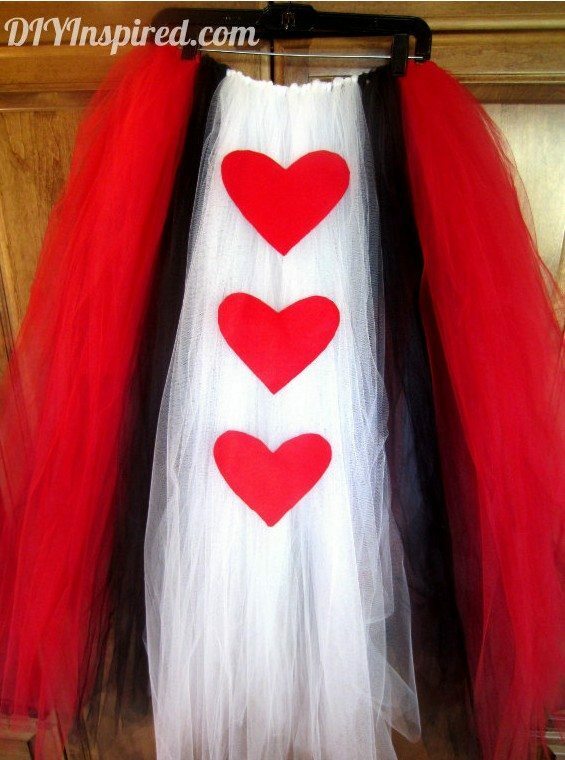 I used black, red, and white tulle and added three felt red hearts with hot glue. I also made a crown out of a recycled plastic sour cream container. For this adult skirt I bought tulle by the yard because it was much cheaper that way (don’t forget to look for a coupon!). It was about 11-12 yards (approximately 6 red, 4 white, 2 black) for this skirt. I measured from my hips to ankles and doubled it for the length. I only used one layer of tulle all around and wore black tights underneath. This is my daughter’s Alice skirt. I added the felt spade because I wanted us to match. J She will also wear a white t-shirt with puffy sleeves, a black ribbon in her hair, white tights, and black Mary Jane shoes. Tip: Tulle also comes glittery as well. Consider mixing the two kinds, but if you do, make the skirt outside! Glitter everywhere (I learned the hard way)! You can play around with accessories like, tiaras, crowns, wands, gloves, shoes, etc. Remember: check the dollar store first! My daughter loves Tinkerbelle. This is such a perfect idea for fairy costumes. They would be cute party favors too. I was wondering how much tulle you needed for the adult skirt? Which type did you buy, pre-cut or by the yard? Hi Sara Jane! For the adult skirt I bought tulle by the yard because it was much cheaper that way (don’t forget to look for a coupon!). I believe it was about 16 yards for both skirts pictured, so I would guess about 11-12 yards. I’ve made a tutu before for my daughter but the tulle just stuck together and looked like a big matted ball and I couldn’t get the strips to straighten out. How do you get and keep the strips to lie straight? So strange! I haven’t had that happened. I do recall when making these that I would run my fingers through the strips as I made each knot. It is also helpful if you tie the band around a chair back (or something similar) so that it stays in place as you add each strip. I hope this helps! Hi Jennifer! I wore a black tank top with a cropped short sleeved black jacket. You should definitely try it! It’s SUPER easy. You just need a large work space (floor area). How long did you cut the pieces of Tulle for the adult size costume? I think this is a great idea and would love to do this for our Disney Halloween trip. Hi Nancy! Glad you like it! I measured from my hips to my ankles and then doubled it. 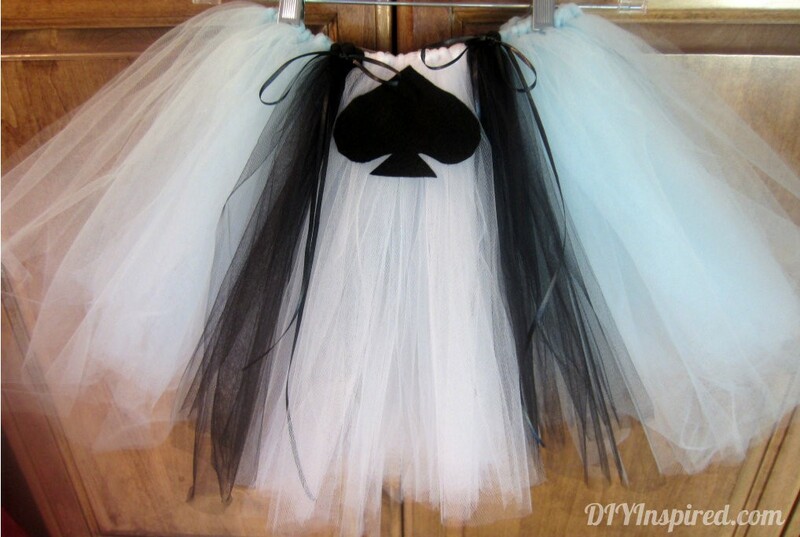 These tutus look awesome! I’m hoping to be the Queen of Hearts for Halloween. I was wondering if you did multiple layers of tulle, or just one around the elastic? I’m trying to make the Queen of Hearts tutu for myself. I think it is an awesome idea! How much tulle did you use in each color? Hi Audrey! I know I should have included that, so be forewarned this is a guess (since this was so long ago)! I think I used about 6 red, 4 white, and 2 black. It this in rolls or yards? I had the same problem as another commenter. They strips wound up coming out wavy and kind of bunched up. My daughter was happy with it but wonder why it happened. Hi Kim! I’m not sure why the strips get wavy. Maybe a snag in the scissors? So strange! I’ve made so many of these and that’s never happened. I’m glad it worked out in the end! How much Tulle do I need for a Child’s skirt? Hi There! Our family is going to Disneyland in a couple weeks and we are going to the Halloween Party! I’m dressing up as the Queen of Hearts and I LOVE this skirt idea. I have a couple questions for you before I get started. I’ve purchased tulle by the yard (10 each of red, black & white) and I’m curious if you cut yours into narrower strips than how it comes. If so, how wide were they? It looks like you did in the picture, but rather than guess I thought I’d ask. Does it make a difference in how wide of a piece of ribbon you use for the waistband? I’d like to copy your idea (why reinvent the wheel?) so any tips you can give me would be appreciated! One last question: what do you think is the best way to attach the hearts? I will be making mine out of felt, but wasn’t sure if hot glue, or something else would be the best way to attach them to the skirt. I’m super excited about this cute (and I’m hoping comfortable)costume to roam around Disneyland in! Thanks for the great idea. I’m definitely going to use this to make my granddaughter a Princess skirt also! Yes, I cut them in strips about 5-6 inches wide. They weren’t perfect and I still have that skirt today! I used hot glue to glue on the felt hearts. Just make sure the tulle strips are straight when you glue it on because you won’t be able to move it if you make a mistake in placement. I’m so glad you like this. Let me know how it turns out! Have fun at D-land! Thanks for your advice! I’ll let you know how it turns out. For the queen of hearts skirt did you use ribbon or elastic to tie thw tule on? So sorry for the late response, Linda! I hope it’s not too late! I used ribbon for mine. I am putting this skirt together for Halloween. How do you get the tulle to lay nice an flat? Mine seems to be overly poofy. Hi Meg! Try less strips and loosen the larks head knot a tad and then spread them out.